I love this idea that coke seems to be doing. I think this happened to me before. I was way younger. So it's nice to see that they are bringing this around again. I'm sure that this will make alot of people smile and bring joy to them. I wrote a short story about this, it's the Virgo in me. BUT what if the guy (or women) who loaded the machine had just filled it with bears. 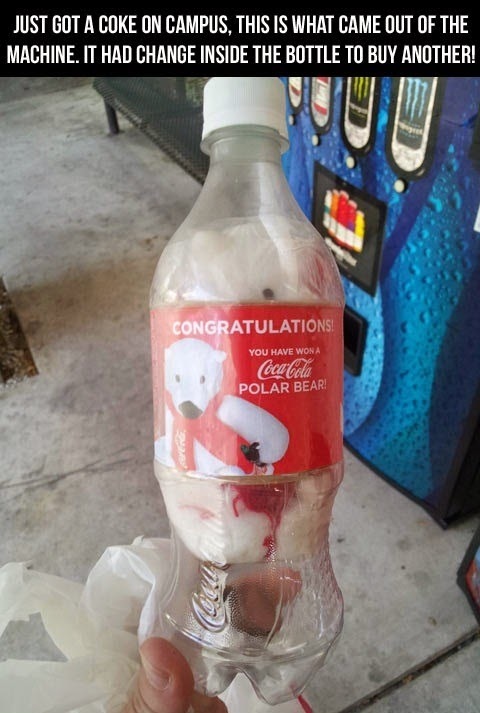 You get a polar bear and it’s a nice surprise and you put the change in for another coke but you get another polar bear and you’re like "hm that was weird but hey I got two polar bears that’s pretty cool"
All YOU wanted was a coke.